I'm sure every body has heard about the terrible last Friday's multiple accident on the Benin-Ore Road, in Igbogui, Ovia South West Local Government Area of Edo State. The mass burial will be held Saturday (today). I've passed that road on my way to Benin several times and I must say it's a death trap. Inshort, I've driven from Lagos through that road to Benin once and I remember how mad at me my elder sister was. She said I was putting my life on the line as it was considered a very dangerous venture because of the terrible state of the road. Read the touching story of 2 of the accidents victims after the cut. 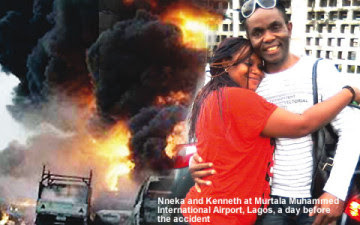 One of the most shocking stories of the tragic accident involving a Young Shall Grow luxurious bus and a Dangote cement truck was that of Nneka and Kenneth Ojielo, a couple who died in the accident. Theirs is a story that will bring tears to many eyes because Kenneth had not seen his wife in the last 10 years until Thursday, the day before they both perished in the explosion. Nneka’s younger brother, Ogonna Abako, told Punch that “Kenneth traveled to Austria in 2003 in search of greener pastures. Before he left, they already had five children. Their eldest child is 21. “They actually got married very early. Kenneth was 26 years old when they got married while my sister was about 20 years old at the time. Everybody was joyous when we heard he was coming home." A picture of the joyous reunion taken by Ogonna’s wife on her mobile phone at the airport showed a couple with much happiness written all over their faces. On Friday, they decided to travel to Enugu. Kenneth wanted to meet his children as soon as possible. The children too were ecstatic in Enugu as they kept calling, asking their father, whom they had not seen in the last 10 years, to get home on time. Ogonna said, “I drove my sister and her husband to a hotel and lodged them there. The following day, I woke up early to take them to the bus park. We got to Jibowu and realised that the Ekene bus they wanted to take had already left. The couple held hands in the bus and prayed for journey mercies as Ogonna bid them farewell, not knowing it was for the last time. He said he called his sister’s phone at 3pm but it did not connect. He thought there was at network problem. “When it was 6pm, my sister’s eldest child called and said she had not seen her parents. I then asked my brother to go to the Young Shall Grow park in Enugu. He was told there that only two of the company’s buses took off from Lagos that day, one from Maza Maza and one from Jibowu. “Many families were waiting for their relations at the park too. The bus that took off from Maza Maza got to the park and that was when the passengers broke the news of the accident to waiting families. Those children will never see their father and mother again,” Abako said as he dabbed at his teary eyes. 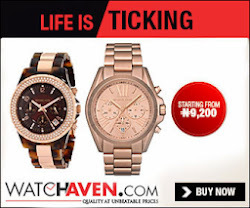 Worse is the fact that their bodies cannot be claimed by their family members for burial as they were burnt beyond recognition and were therefore given a mass burial on Tuesday in Benin. May their souls rest in peace and may God give their family the fortitude to bear the loss.